If confirmed to lead the Environmental Protection Agency’s Office of Chemical Safety and Pollution Prevention, Dourson would oversee the agency’s review of 1,4-dioxane, which is one of 10 high-priority chemicals the EPA is slated to review under a revamped version of the Toxic Substances Control Act. Trump’s EPA has already begun to cook the books by underestimating the ways that consumers are exposed to 1,4-dioxane. If confirmed, Dourson would ensure that junk science is baked into the final results. 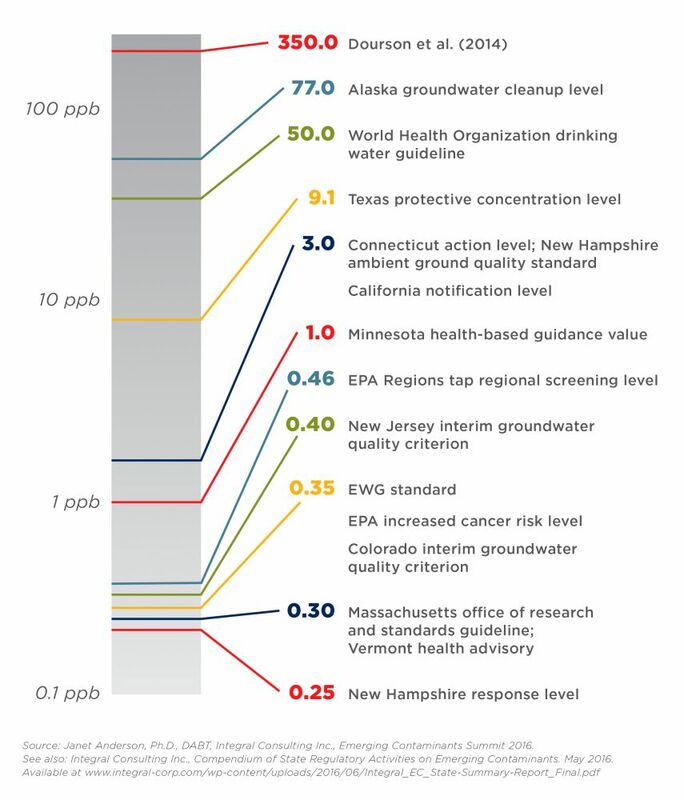 As the head of a science-for-hire consulting firm, Dourson authored two papers, released in 2014 and 2017, that argued 350 ppb is a safe 1,4-dioxane exposure level for people. This level is 1,000 times greater than the EPA’s increased cancer risk level of 0.35 ppb. Dourson’s 1,4-dioxane research was funded by PPG Industries, a manufacturer of paints and coatings, whose 1,4-dioxane releases have contaminated public water supplies near its facilities. Water supplies for more than 7 million Americans in 27 states are contaminated with 1,4-dioxane at levels higher than what federal scientists say pose a minimal lifetime risk of cancer, EWG found. But, a separate EWG analysis also found that thousands of shampoos, soaps, lotions, sunscreens, toothpastes and cosmetics may also include the possible carcinogen. More than 8,000 personal care products in EWG’s Skin Deep® cosmetics database include ingredients produced through ethoxylation, including polyethylene, polyethylene glycol, or PEG, and ceteareth. Although 1,4-dioxane is not intentionally added to personal care products, ethoxylated chemicals can contaminate personal care products with trace amounts of 1,4-dioxane. Some companies voluntarily remove or reduce 1,4-dioxane from these products, but there are no rules that require them to do so. Many of the products in Skin Deep that contain ethoxylated chemicals – and thus may contain 1,4-dioxane – are marketed to children. Dourson's advocacy for a lax 1,4-dioxane standard is typical of his career. On behalf of the chemical industry, Dourson has repeatedly sought to weaken safety standards for PFOA, a carcinogen formerly used to make Teflon, and perchlorate, a jet fuel chemical that hinders the development of babies’ brains. He's also worked to greenwash chlorpyrifos and other herbicides linked to cancer and brain damage; the food chemical diacetyl, which gives workers “popcorn lung”; and TCE, the cancer-causing chemical made infamous by the book and movie “A Civil Action.” Other polluters that have paid for Dourson’s services include Monsanto, Dow and the Koch brothers. This week, a key Senate committee will hold a hearing on Dourson’s nomination. His record on 1,4-dioxane and many other chemicals shows he’s the wrong person for the job.